For many years now, I have dreamed of experiencing a winter wonderland style Christmas in the Northern hemisphere. Snowball fights, cosy jumpers, hot chocolates, warm fires… you get my point. Naturally I was pretty excited to spend Christmas in Japan because it’s not unheard of to have a white Christmas here. Unfortunately for me I didn’t get quite the wonderland I was hoping for (only a couple of very small flurries), but it sure was cold and that was enough for me! Liam and I woke up early and headed to JR Ōsaka station. Our plan was to spend the day in Kyōto, wandering through peaceful gardens and admiring centuries old architecture. But first we had to meet up Liam’s parents, Steve and Donna, who had decided to spontaneously fly over from Hong Kong to spend Christmas day with us! We found them pretty easily, waiting on the train platform for us, and after much Merry Christmas-ing and hugging we jumped on a train bound for Kyōto. As this was Liam, Steve and Donna’s first time in Kyōto, I decided to go with a classic and probably my favourite temple, Kiyomizu-dera. Kiyomizu-dera is a Buddhist temple perched on the beautifully wooded hillside of eastern Kyōto. 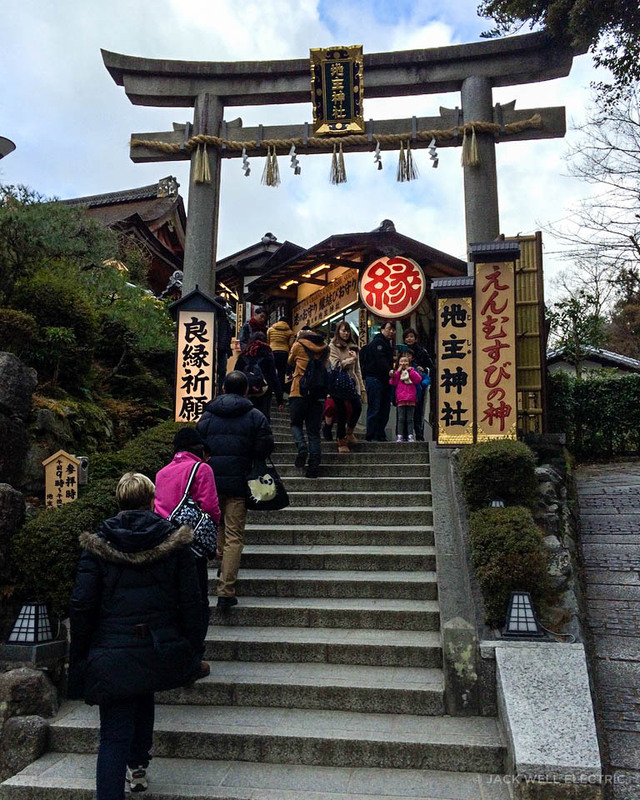 Kiyomizu-dera literally means pure water temple, aptly named because it shares the hillside with the Otowa waterfall. I have been lucky enough to experience Kiyomizu-dera during all four seasons and whilst I do think the temple is exceptionally beautiful during autumn and spring (especially when the sakura are in bloom), it is still a magnificent sight in winter. 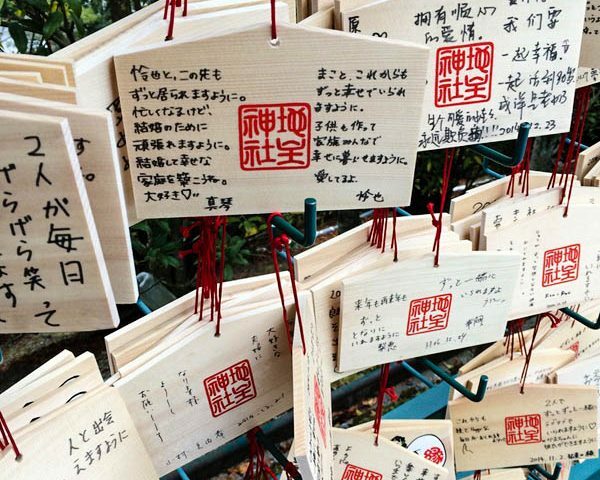 Ema or wooden wishing plaques outside Kiyomizu-dera. Before entering the temple, wash both hands and rinse your mouth. But don’t drink directly from the ladle! A wide cobbled lane lined with shops winds it’s way up the hill towards the temple. 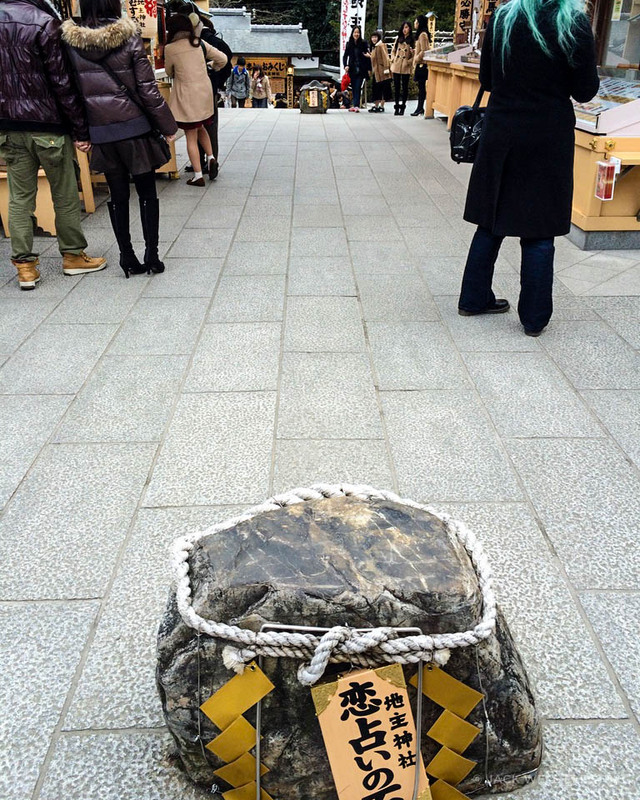 Take your time here to explore the shops and sample some of Japan’s best sweets. As it was quite cold, the boys happily feasted on hot pork buns while I ate warm anpan (a delicious fluffy bun filled with sticky sweet anko or red bean paste). My favourite area of Kiyomizu-dera is the large wooden veranda jutting out from the main hall. 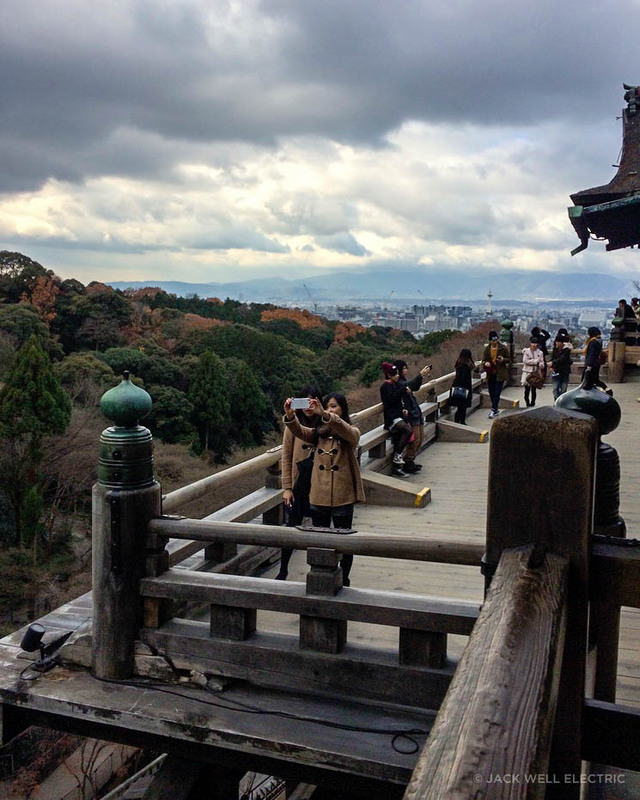 Here you can see breath-taking views of Kyōto. Despite the wide sweeping view, I think it feels quite cosy on the veranda nestled among the trees with the smells of burning incense wafting from large copper trays. The amazing view of Kyoto! 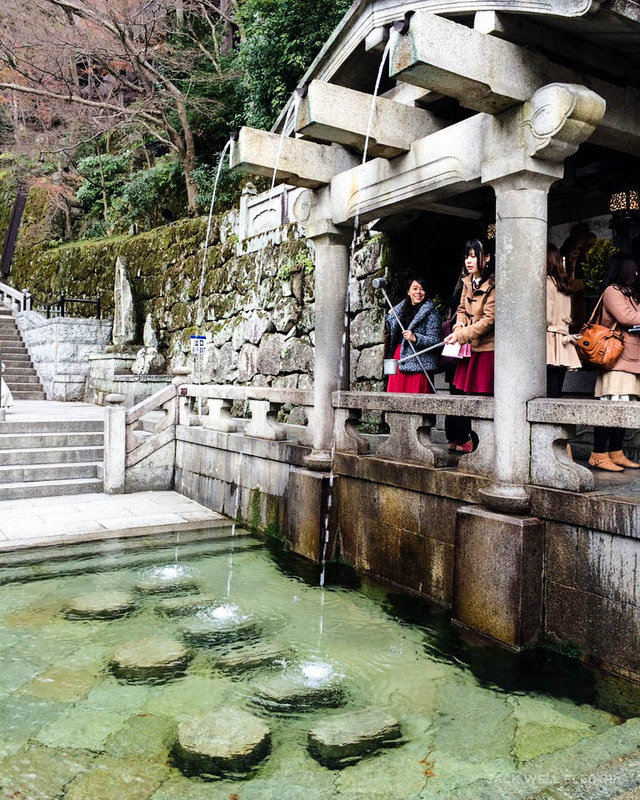 Beneath the temple is the beautiful Otowa-no-taki, a waterfall with three fountains of water spilling into a clear pond below. The line of people waiting to drink from the waterfall can be a bit daunting, but it’s worth the wait (even if it’s just for the photo opportunity). 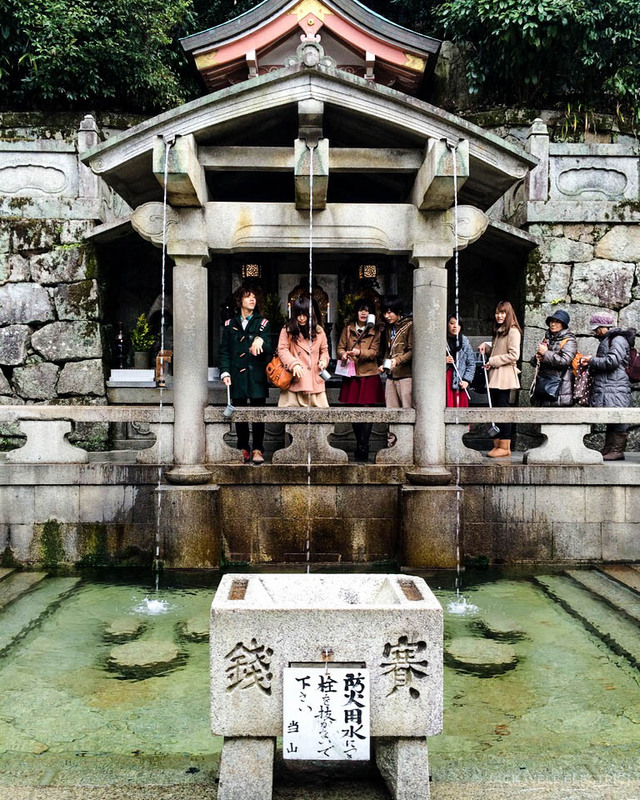 Each fountain is said to have a different power; longevity, health and study. 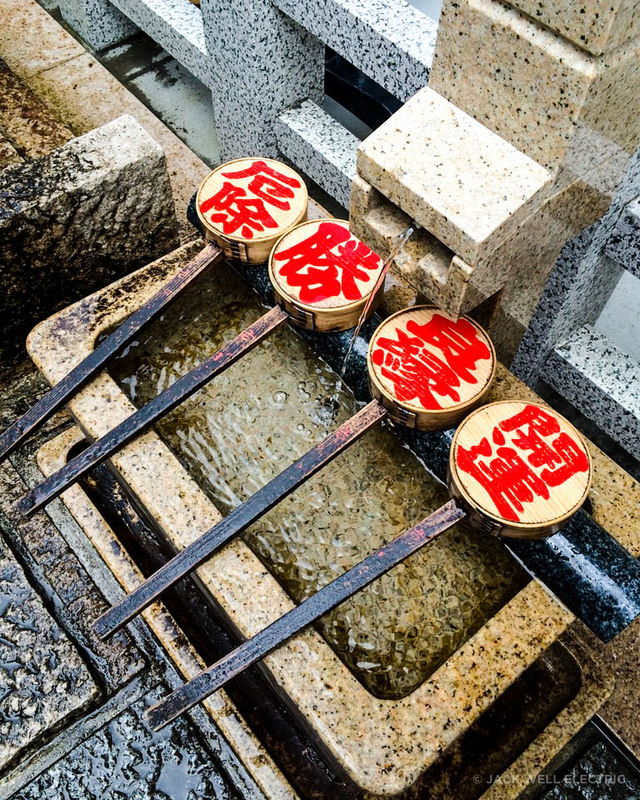 You can choose which fountain you’d like to drink from and that water will bring you good luck. But make sure you only choose one! 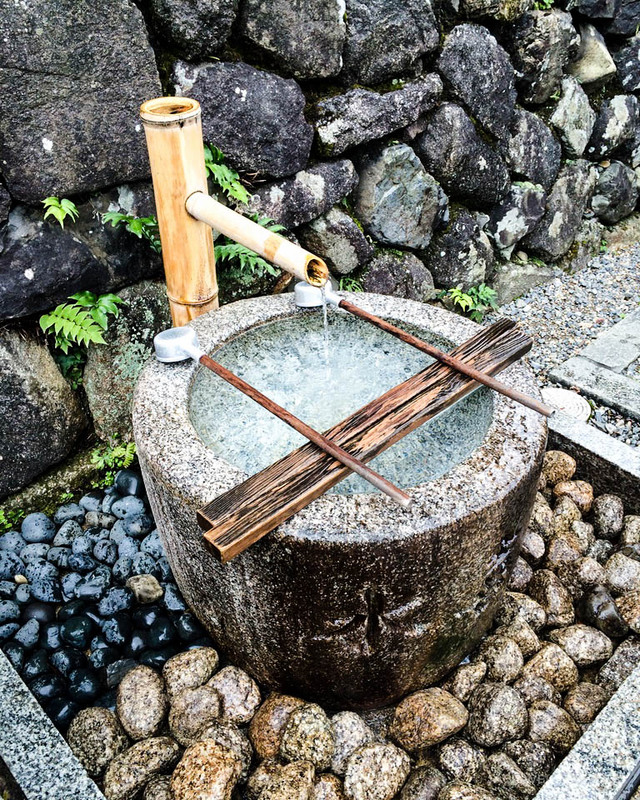 Drinking from more than one fountain is considered bad luck. Which fountain would you choose? 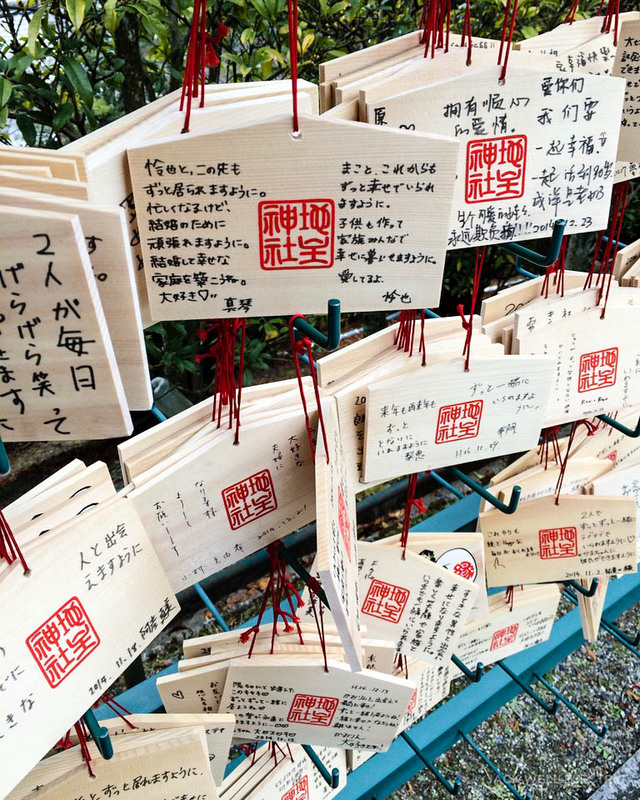 If an arrow from cupid’s bow is what you’re after then head over to the Jishu Shrine, which is located within the temple grounds. 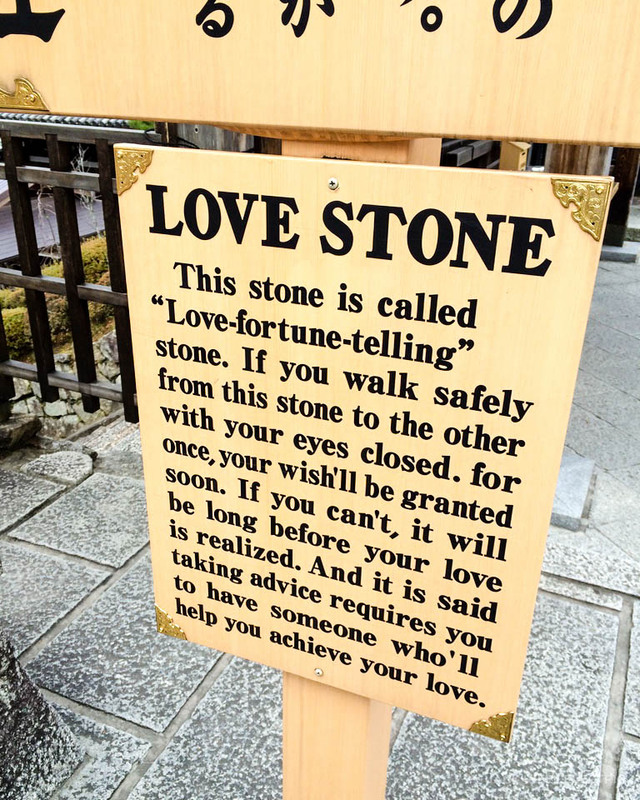 This shrine features 2 love stones, set a few metres apart, and it’s said that if you can successfully walk from one stone to another with your eyes closed you’ll find your true love. If you’ve already found love then have your partner help out by giving you directions. Donna gave it go and with Steve’s directions, she reached the love stone! We finished off our day in Kyōto with a very late Christmas lunch in the Porta underground shopping mall beneath the futuristic JR Kyōto station. With over 100 shops and restaurants, it’s easy to get overwhelmed here! Every restaurant, bar and cafe has amazing displays of plastic food out the front that look more and more delicious as you venture further into the mall. We settled on a beautiful little Italian restaurant which was a toasty haven after being out in the cold all day. Pasta was eaten, wine was drunk and laughs were had all round. It was a perfect Christmas day. From JR Ōsaka take the Kyōto Line bound for Kyōto and get off at JR Kyōto. Take the north exit out of JR Kyōto station and head towards the bus terminal. 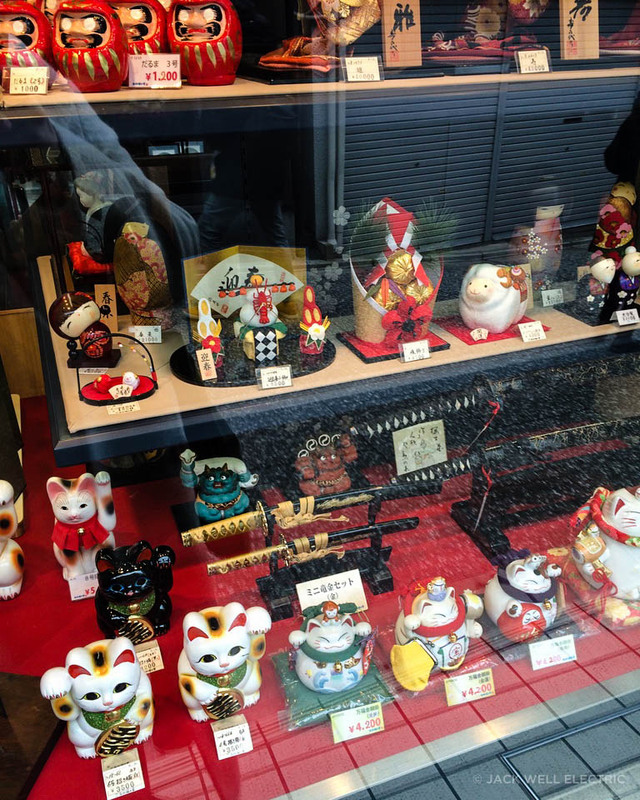 Take bus number 100 or 206 and get off at Kiyomizu-michi bus stop. Follow the signs to Kiyomizu-dera (about a 10 minute walk).